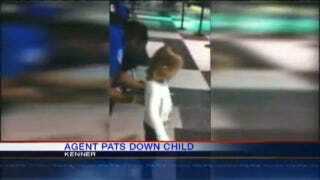 Perhaps embarrassed by the many YouTube videos in which agents frisk small children while parents look on in horror, the TSA has announced that it will be deemphasizing patdowns in children twelve and under. According to the AP, Homeland Security Secretary Janet Napolitano told Congress yesterday that in the coming weeks, kids won't have to remove their shoes anymore. Also, TSA agents will use other methods to reduce the necessity for patdowns: they'll send kids through imaging scanners or metal detectors multiple times if necessary, or use hand swabs to check for explosive residue. There may be some exceptions to the new policy in order to keep terrorists guessing, says Napolitano: "There will always be some unpredictability built into the system, and there will always be random checks even for groups that we are looking at differently, such as children." Still, the new rules should please parents and everyone else who was disturbed by footage of little kids apparently getting groped by uniformed officials. Add that to the news that adults may soon be able to keep their shoes on as they go through security, and it looks like the screening process could get significantly less hellish. Now if they could figure out a way to let us keep our toiletries in a normal cosmetic bag instead of a ziploc, we'd really be in business.